The Brain stole Hollywood's hottest new movie script. As the Warner Bros. CEO, I'm giving you (and the Animaniacs) the job of finding the script's missing scenes by searching through 7 Warner Bros.' movie sound stages filled with hilarious hijinks. Watch for Tinsel Town Traps and Movie Classic Power Ups scattered throughout the "Ocean of Door", "Adventure Kingdom", "Sci-Fi Scene" and "Fantastic Fantasy Zone". I don't care what Mr. CEO says. If I catch Yakko, Wakko and Dot anywhere on the studio's back lot, I'm going to throw them back in the water tower where they belong! 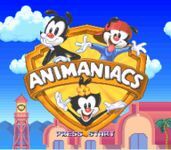 Control your favorite Animaniacs - either Yakko, Wakko or Dot. They jump, dash, bounce and even climb on each other's shoulders to overcome obstacles. If one of them gets captured, you'll get the chance to go on a Water Tower Rescue Mission. The Animaniacs have never looked soooooo real or moved soooooo fast, except for that time when they starred with Harry Fjord in the Swedish smash "Scandinavian Smith and the Temple of Smorgasbords". "Hellloooooo, Nurse!" You'll see your favorite characters from the hit TV series like Dr. Scratchansniff, Ralph the Security Guard and the Goodfeathers. Be careful not to let any of their special "features" distract you. BRAIN: We'll wait for Yakko, Wakko and Dot to find the script's missing scenes and then steal them back and sell them so we can use the money we earn to take over the world. Pinky, are you thinking what I'm thinking? Pinky: Yeah, Brain, it'll make great pancakes.